The $125 billion Employees’ Provident Fund is making its maiden foray into equity. The planned 5 percent allocation to stocks doesn’t pack the punch of Japanese pension funds’ recent portfolio shift. But a bolder switch will require overcoming unions’ mistrust of markets. 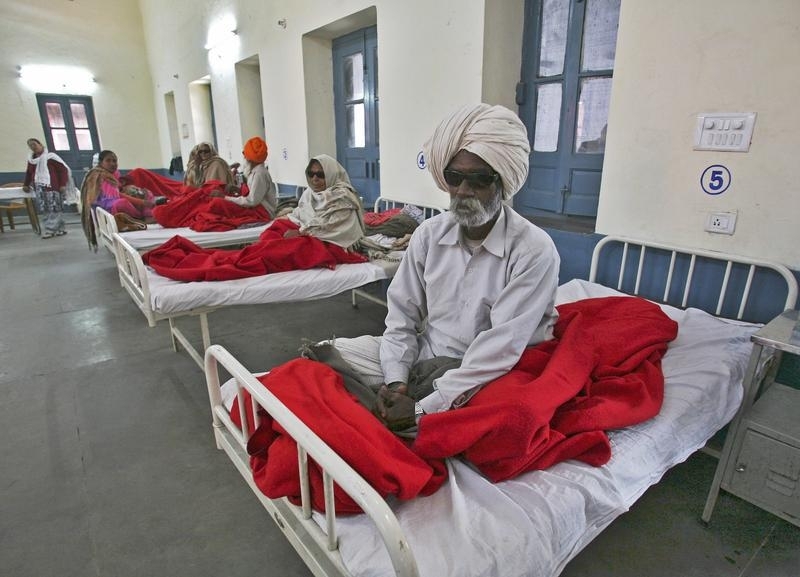 People sit on beds while waiting for treatment at a hospital after undergoing cataract removals from a free eye surgery camp, in the northern Indian city of Amritsar December 5, 2014. The Indian government has decided to allow the state-run Employees’ Provident Fund Organisation (EPFO) to invest 5 percent of its assets in exchange-traded funds, Labour Secretary Shankar Aggarwal told reporters on April 24, according to the Press Trust of India. “We will begin by 1 percent and go up to 5 percent by the end of this financial year,” Aggarwal said. India’s fiscal year runs from April 1 through March 31. The provident fund, into which employers and employees contribute every month, had 6.3 trillion rupees in assets on March 31, 2013, according to its last annual report, and is growing by 16 percent a year. The fund’s size is currently estimated at 8 trillion rupees ($125 billion), according to media reports. The finance ministry had earlier asked the labour ministry to allocate up to 15 percent of its investible resources to equity. A 5 percent allocation to equities would translate to $6.25 billion of investment in stocks by the EPFO over the next year. That’s equivalent to about 0.4 percent of the present value of shares listed on the National Stock Exchange. The 80 million-member EPFO was the world’s ninth largest manager of social security funds by assets in 2012, according to Reuters. Japan’s Government Pension Investment Fund (GPIF) is the biggest. Japan’s social security funds, led by GPIF, boosted their equity holdings by 14.5 trillion yen ($122 billion) between 2012 and 2014, according to the Bank of Japan’s data. That’s about 2.5 percent of the value of shares listed on the Tokyo stock exchange.